Would you like to read about what satisfied clients of the law offices of Joseph C. McIntyre have to say about their experiences with our firm? Click here to learn how a Miami injury attorney can help you. Attorney Joseph C. McIntyre has been practicing personal injury law in Florida for over 30 years. Attorney Joseph C. McIntyre has been aggressively pursuing the rights of accident victims in Florida for over 30 years. Attorney Joe McIntyre is experienced in handling all aspects of claims involving injury or death from car or truck accidents, slip and fall accidents, defective products, motorcycle accidents, wrongful death and all cases where one is injured through the fault of another. Mr. McIntyre is available for consultation throughout Florida. Mr. McIntyre was admitted to the Florida Bar in October, 1983 after graduating from the University of Miami School of Law in May of 1983. Attorney McIntyre’s practice has been devoted solely to representing injury victims. Attorney Joe McIntyre is a recipient of the Client Distinction award from Martindale-Hubble. Attorney McIntyre earned a perfect Client Review Rating Score of 5.0 on a scale of 1-5. 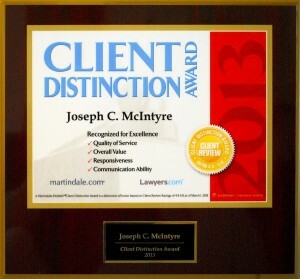 Less than 1% of the 900,000+ attorneys listed on martindale.com and lawyers.com have been accorded this Martindale-Hubbell honor of distinction. Attorney McIntyre is available for consultation by dialing toll free 1 877 INCOURT (1 877 462-6878). All cases are handled quickly and confidentially on a “Contingency Fee” basis. The consultation is free and there are no fees or costs unless you collect money. The hiring of an attorney is an important decision that should not be based solely upon advertisements. Before you decide, ask Mr. McIntyre to send you free written information about his qualifications and experience. Please call or e-mail any time regarding your injury or death claim. 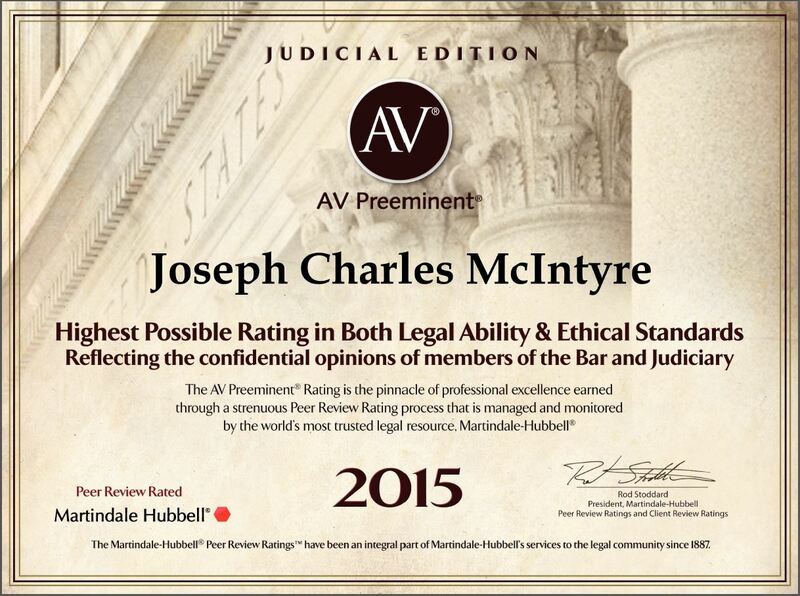 Attorney Joseph C. McIntyre has been recognized with an AV Preeminent 5.0 out of 5 rating, the highest rating for both legal ability and professional and ethical standards, by Martindale-Hubbell. 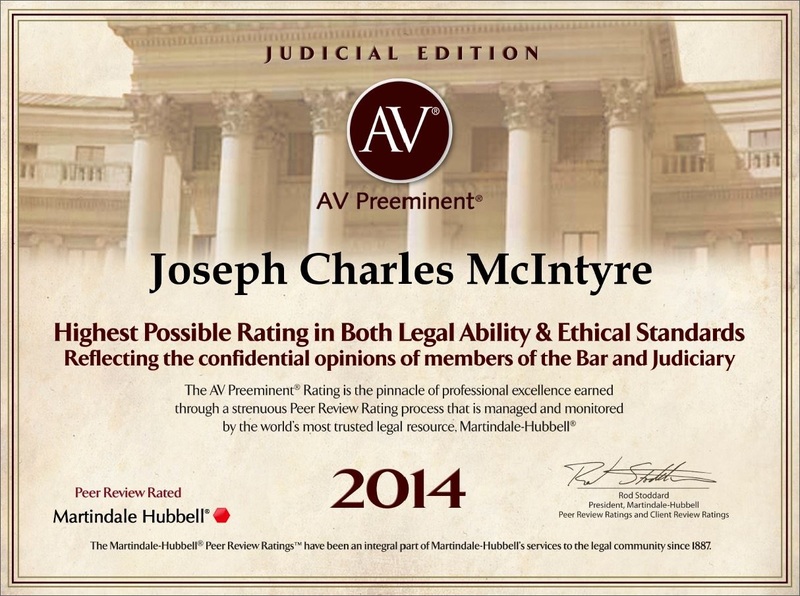 Lawyers with an AV Preeminent rating from Martindale-Hubbell are those who have been recognized by their peers for excellence in both legal ability and ethical practice. Martindale-Hubbell Peer Review Ratings™ reflect a combination of achieving a Very High General Ethical Standards rating and a Legal Ability numerical rating. Legal Ability ratings are based on performance in five key areas. Legal Knowledge – Lawyer’s familiarity with the laws governing his specific area of practice. Legal Experience – Lawyer’s degree of experience in his specific area of practice. Through Peer Review and Client Review Attorney Joseph McIntyre has achieved the Highest Possible Rating. 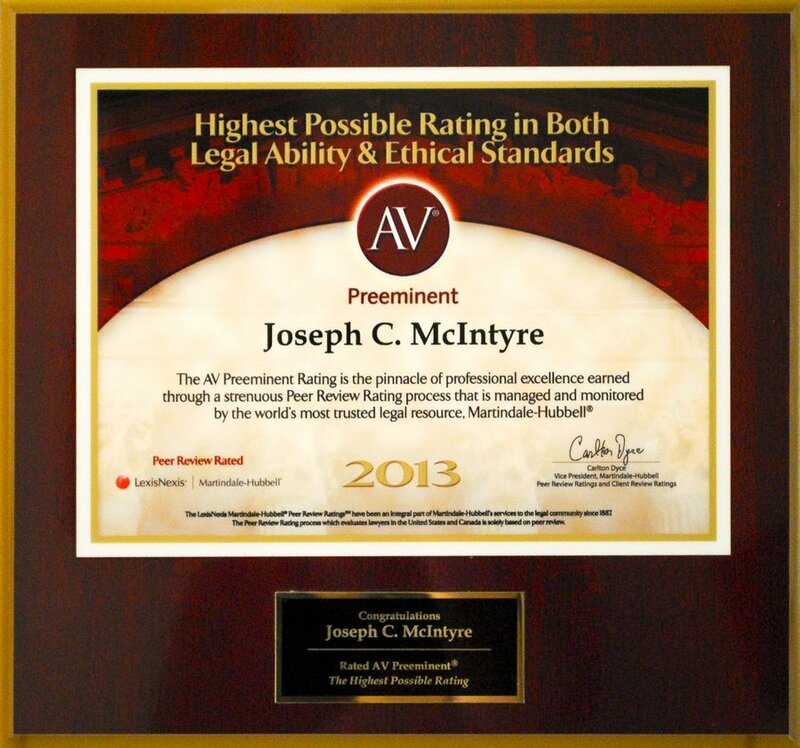 AV Preeminent (5.0) – AV Preeminent is a significant rating accomplishment – a testament to the fact that a lawyer’s peers rank him at the highest level of professionalism. “When I am late, I drive slower”. A lesson learned from a client.